LITTLE ROCK, Ark. - 5 P.M. update: There's a chance for winter weather in North Arkansas late Friday. As temperatures continue to get colder an area of low pressure coming in from Texas will spread rain into Arkansas Friday. Our meteorologists say rain is expected in Central and South Arkansas from the middle of Friday through Saturday. Central and South Arkansas will receive anywhere from a half inch to an inch and a half of rain. 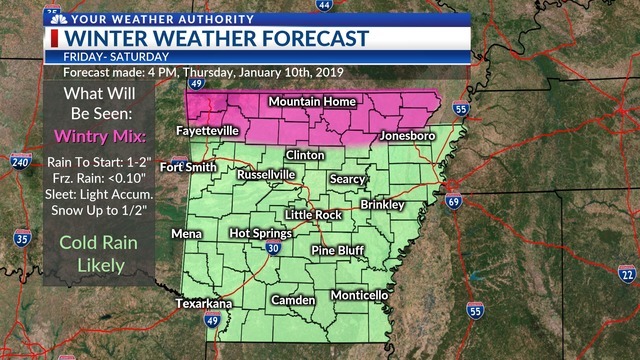 In North Arkansas, cold rain is expected for Friday with a change to a wintry mix. A wintry mix is defined as a mix of rain, freezing rain, sleet and or snow. However, surface temperatures will be above freezing during the day Friday. That and rain will limit accumulation of the frozen kind. Friday night temperatures are expected to fall closer to freezing if not below freezing. When that occurs some sticking or accumulation of wintry precipitation can occur but only small amounts may accumulate.